Another game, another injured player, but this time the Bruins could not overcome the loss as they were defeated by the Washington Huskies, 69-65 before a sellout crowd at Pauley Pavilion. The Bruin injury procession continued in this game when freshman forward Alfred Aboya left the game with 7 minutes in the first half due to a right knee sprain. Aboya was standing alone at the top of the key when he turned to his right and tweaked his knee. Aboya had surgery on both his knees prior to the start of the season. Despite the injury to Aboya, the Bruins still were able to take a 40-28 lead into halftime. But in the second half, the Huskies began to chip away at the Bruin lead, and with 7:00 left in the game they went on a 10-0 run to take a 61-60 lead with 3:11 seconds left in the game. UCLA (14-3, 4-2) had an opportunity to pull out the game with just 11 seconds left and still down only one point, the Huskies’ Mike Jensen, a 61% free throw shooter, missed the front end of a one and one, but Huskies’ freshman Jon Brockman muscled his way in and kept the ball alive until Bobby Jones grabbed the loose ball and was fouled on his shot. Jones made one of two of the free throws for a two point lead, but then on the ensuing Bruin possession, Farmar passed the ball to a cutting Luc Richard Mbah a Moute, but Mbah a Moute received the ball out-of- control and was called for traveling and the Bruin’s last threat in the game was over. In the first half, the Bruins executed well in their half court offensive sets, similar to the first half against Washington St. The team shot 54% from the field and were paced by the 3-point shooting of Michael Roll who scored 14 first half points. Defensively, the Bruins rotated and challenged every shot while holding the Huskies to only 36% FG shooting in the first half; moreover, the Bruins clamped down on the Huskies’ leading scorer Brandon Roy who scored only 7 points in the half. Roy came into the game as the Pac-10 scoring leader averaging 19.4 points per game. But the second half was a different story – a Huskies story. Washington (14-2, 3-2) shot 64% and out-rebounded the Bruins by six in the half. In addition , the Huskies stepped up their defensive pressure and limited the Bruins to 43% shooting. For the game, the Huskies out-rebounded the Bruins 32-26 - 14 of those rebounds were on the offensive end. Bobby Jones led the Huskies with 12 rebounds. The Bruins only went to the free throw line 5 times while the Huskies shot 13 times from the line. “It’s hard to win when you get out-rebounded and let the other team shoot 60%”, coach Ben Howland said. “They grabbed 14 offensive rebounds which means they got 14 extra chances for scores”. For the first time this season, Arron Afflalo did not lead the Bruins in scoring. Instead Michael Roll had scoring team-high honors with 17 points, but he only had 3 points in the second half after the Huskies designated a defender to stay close with him after his hot first-half shooting. Roll played a team-high 34 minutes in the game. Jordan Farmar finished with a career-high 12 assists but scored only 3 points on 1-7 shooting. After it was suggested to Howland that Farmar’s ankle was hampering his offensive production. “We need Jordan to shoot more”, Howland said, especially considering all the injuries the team has sustained this season. Arron Afflalo contributed 16 points but on 6-16 shooting. As always, Afflalo was doing triple duty - guarding the opposing team's best player and creating his own shot - all while still recovering from a hip pointer and bruises from a nasty fall last week at Arizona St.
Luc Richard Mbah a Moute was a bright spot for the team. He recorded another double-double scoring 13 points and grabbing 11 rebounds. Freshman Ryan Wright, who started the game in place of the injured Lorezno Mata, scored 8 points but for the second game in a row did not record a single rebound - a statistic the coaching staff can not be pleased with. In Pac-10 play so far, Wright has averaged only 1 rebound per game. Both senior centers Michael Fey and Ryan Hollins played in the game. Fey played only 1 minutes while Ryan Hollins played 17 minutes grabbing 4 rebounds and scoring 3. 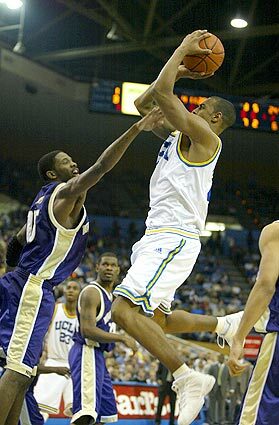 It was the Washington Huskies first win over UCLA at Pauley Pavilion since January 29, 1987. The Bruins will try to re-group when they take on their cross-town rival, the USC Trojans, in a big game on Wednesday.